Necrosadistic Goat Torture – I am inclined to make at least one of two claims with the name of this fierce English fivesome. 1) It is one of the most ingenious band monikers in known history and me saying this would indicate that I have enjoyed enough Jäger for the day OR 2) The members of this goat-obsessed group have listened way too much Impaled Nazarene. I would assume that the name alone tells a whole lot about the musical direction of this record. Yes, no rocket science is necessary to detect the extremely raw-yet-surprisingly-coherent production backing up tremolo-picked speed riffs, deathmetalling groove-sections and charred vocals dripping with the usual themes of hate, misanthropy and sexual abuse of small, furry rodents. Drummer Goatlord is very capable in delivering a spunky thrashtempo along with the mandatory blastbeats. Guitarists Goatess and Goatcommando render their wrists numb while ripping through their best hyperspeed Marduk-emulations and also show some technical flash with the Slayer-ishly mindless solos. Bassplayer Goatmaster has been given plenty of space in the soundscape as the bass pounds mightily on top like Ron Jeremy in his prime. Vocalist Goatthroat alternates easily between a guttural cookiemonster-growl and an unfortunately mediocre throat screech. I must say that I enjoyed the moshpit-craving Morbid Intentions and the melodic Anger Overload. After these two the tunes took on a more yawn-inducing method of beating my ears down. Luckily the band’s loving ode to the PETA, Hamster Fucker, lifted my spirits again with a strong, punky attitude. A definite party song that most likely will not get my ladyfriend in a sensual mood. But great fun anyhow. One might wonder what an AOR/Thrash-wanker like myself is doing reviewing more kvlt-stuff like this. The answer is 42. 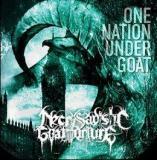 For blackish metal, I enjoyed One Nation Under A Goat considerably. The guitars and drums could have definitely used more muscle in the production and I did get tired of Goatthroats voice after a while. Still, worthwhile to be checked out and more than endurable. Check out some songs here .